Well, first and foremost, the entire segment’s concept (“How to pick the right breed for your family”) is not only misleading for those looking to add a dog to their family, but downright dangerous. To publicly disseminate the idea that every dog of a specific breed is appropriate for, say, a family with kids puts families and children at huge risk for disappointment, injury or worse. 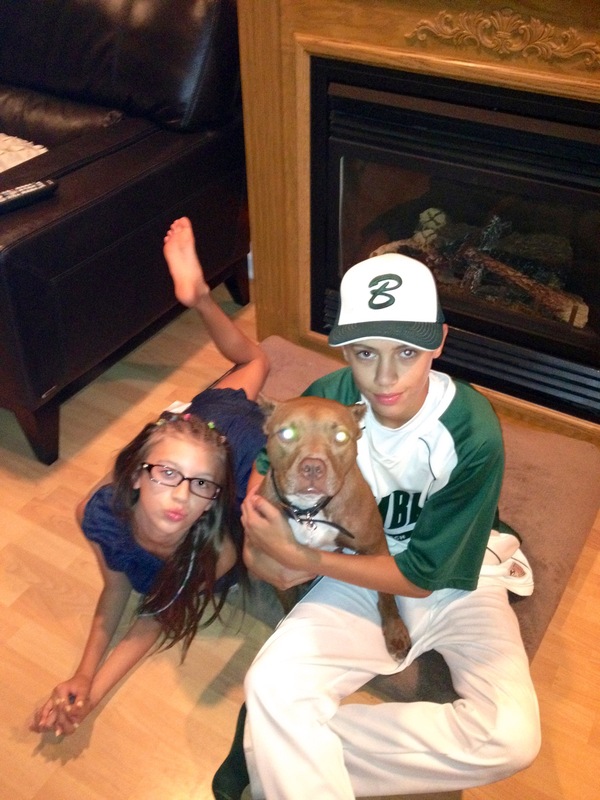 This exemplifies exactly what we, as pit bull advocates, fight against. It is unfair, and unsafe, to assume that all dogs of one breed will behave exactly the same. Every single dog needs to be examined as an individual. The only important information knowing a dog’s breed can give an owner is the dog’s general appearance and potential congenital health disorders, but it will not allow you to determine that dog’s temperament. When choosing a dog for your family, take the advice listed in this article written by Lyn McCallister for Woman’s Day. Her four bullet points will lead your family to thoughtful, considerate and appropriate choices in adding a pet. Secondly, Dr. Halligan is clearly pressed for time. This is TV, people, and we’ve got to fit in as much information into the allotted time period, right? So, as a result of that, Dr. Halligan seems to have forgotten most of her good dog handling skills. The first dog she shows, the Great Pyrenees, is a senior dog, as she says during the segment. The dog probably has some arthritis, maybe some hip problems, and she tugs and pushes it around with such force that it even makes my joints hurt. Next, she brings out a Pug and Shih Tzu. The Pug clearly only has food on the brain (and is pretty darn cute, no? ), but the Shih Tzu is clearly very stressed out. A tucked tail, tense body language, lip licking, dilated pupils. In fact, it even refuses to take a treat from Dr. Halligan several times. The dog then tries to get away from her, just as Kelly throws to commercial break causing Dr. Halligan to inadvertently drag the dog back. To put that dog on television, let alone handle it so haphazardly, shows an incredible amount of carelessness. Lindsay A. Wood wrote another article for the daily camera explaining some basic positive and negative canine body language which can also be helpful in deciding which dog to take home with you. Using her advice when meeting and evaluating potential new pets can prove to be invaluable later on in a family’s life. Do I think that Dr. Halligan is at fault for this misinformation? Maybe , but probably not. Do I blame Kelly and Michael? Certainly not, they’re not just doing their jobs, after all (and pretty darn well, I might add). But I do think the producers of this segment, and the producers of the show overall, should make more conscious decisions about the information they allow to air on a nationally syndicated morning show. Sure, they may not know any better – after all, their expertise is in creating great TV. But in doing so, they carry a responsibility to reinforce safe and positive impressions on their viewers. Telling people to pick a dog based on breed simply does not fulfill this responsibility. So what does this mean? Well, Bully Project‘s October manners classes are already full. Because of space limitations, we can only accept six students into this series of classes. But that does not mean you can’t sign up to be on our waiting list. We will continue to use this list for the foreseeable future and will extend invitations to students as each series of classes is scheduled. “If you are interested in meeting any of the dogs at Animal Farm Foundation, please take a moment to fill out our adoption application. The information you provide will help us make a good adoption match. We have gotten to know our dogs, now we need to get to know you! In Chapter 4, Gorant explains that, “Sometimes responsible pet ownership was more than simply going to a few obedience classes and fencing in the yard. It meant a commitment for the life of the dog to do everything necessary to ensure that nothing went wrong.” I try to explain this to people so often, but I don’t think I could have ever put it as succinctly as this. It’s why I crate train my dogs; why I walk my dogs on martingale collars and easy walk or gentle leader harnesses; why I avoid New York City dog runs. For people who own any kind of dog, remembering this simple statement is crucial! But as owners of pit bulls, I feel like it’s infinitely more important that we take heed: when something goes wrong and there’s a pittie involved (whether it’s the instigator or not), the blame will more often than not be placed on the pittie. And an occurrence like that could have many more ramifications than just on that one singular dog and owner. But Gorant, and Wallace, also try to teach us lessons about life in general: that it’s important to know that “It didn’t pay to get bogged down in the standards and judgments of others; it only mattered that you put your total being into what you were doing.” I think that, in some way, every single one of us knows this – but as emotional beings, we can often get distracted by the opinions of others. And, at least in my life, it’s time to let go of what other people think. It’s passion that important, and if you’re passionate about something (which for most of us is pit bulls), then that’s what you should be doing. I think the overarching theme of Wallace’s story, not only in the book but in real life as well, is that every dog deserves a chance. I learned this first hand with my very first foster, “Foxy.” Despite her serious behavioral issues, I couldn’t give up on her easily. Until I realized that her existence posed great danger to the people and dogs in my community, I felt she deserved a shot. Fortunately for Wallace, his story took a turn for the better and thanks to the Yoris, he’s become a role model for us all. But most significantly, Wallace imparts a tidbit of knowledge that is impressed upon us our whole lives: cherish the time that you have. Towards the end of Wallace’s discing career, he suffered a lot of illnesses and injuries – the sort that take you out of the game forever. But despite Wallace’s ailments, his teammate Roo decided one warm spring day to take him out for one more run before retiring for good. 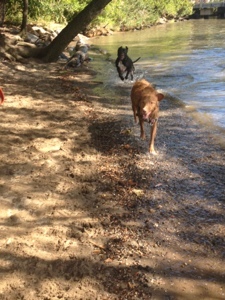 But it was important for Roo to forsake “everything for one more day in the park, playing disc with his dog.” Compared with human life spans, a dog’s life is ephemeral, and for the short amount of time that we have them, we have to love them with everything we’ve got. And doesn’t it look pretty? All those colors, and toys, and treats. Lucy is one happy girl again this month! 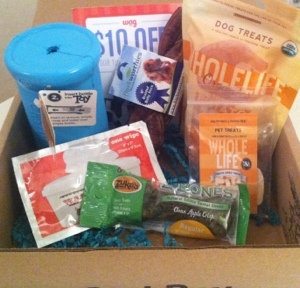 And remember, if you want in on BarkBox, click here and you’ll get $5 off when you sign up. 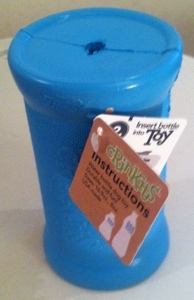 First gift out of the box is a brilliant concept that I have never heard of: the Crinkit Toy by Zigoo Pets. Take any run-of-the-mill plastic water bottle, slip it inside this sleeve, and presto! You’ve got an environmentally friendly, and pet safe toy. When the bottle is destroyed, replace it with another one! Next up, we got a sample wipe of LA Fresh’s W.A.G (Wash-And-Go) pet wipes. I already use a product like this from another company, and think they’re great, solely based on their functionality. 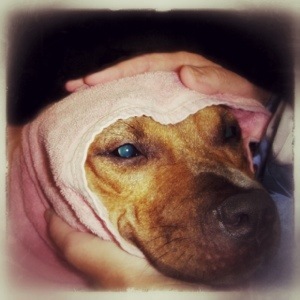 I can’t always put Lucy in the bath tub as often as I would like, so frequently, I’ll whip out the pet wipes and give her a fun, cleansing doggie massage. 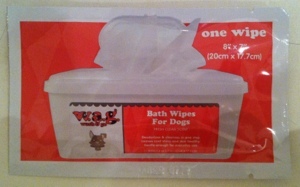 There also great for rainy or snowy days to clean off those messy paws. I’m not sure whether these wipes from LA Fresh are hypo-allergenic or not, though – so if your dog has allergies (like Lucy does), use these with care. 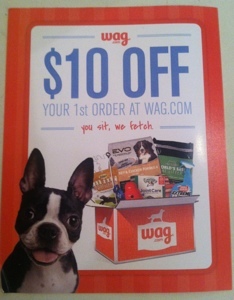 Wag.com included a coupon worth $10 towards my first order with them! Good thing I haven’t ordered from them in the past, because I definitely will now! As much as Lucy loves the next item, she can’t have it. Those darn allergies again. Bully sticks have caused her some serious stomach upset, so this braided one from Barkworthies will have to go into the Bully Project inventory so that one of our future adoptable dogs might get to enjoy it. We then got some great treats that are literally made from one single ingredient, and are completely safe for Lucy to eat. 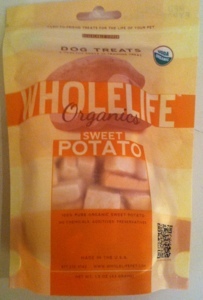 Whole Life Pets‘ freeze-dried sweet potato treats are just that: sweet potato and nothing else. Lucy has already enjoyed several, and I will definitely be placing an order for more. 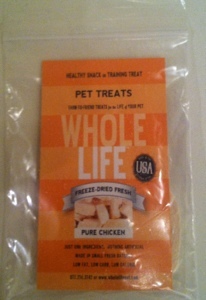 We also got a small sample package of Whole Life Pets’ freeze dried chicken treats, and guess what? ALLERGY ALERT! These will be consumed by a dog, just not Lucy! And finally, we got a Zukes‘ Z-Bone in Clean Apple Crisp flavor. I have been trying a few different breath freshening snacks for Lucy lately (with no allergic reactions so far – hooray! ), so this will now be the next test. We love most of Zukes’ other products, particularly the Z-Filet Grilled Venison formula, so we’re looking forward to giving this one a shot too. We all know I love my Lucy kisses, but I love them even more when there’s fresh breath involved! So that’s another BarkBox sorted through and (mostly) enjoyed. And again, if you want in on the fun, sign up here. Over the summer, we met a wonderful dog at Woofstock named Beau. His owner had passed away, and left behind several animals who all needed to find new homes – fast! All were successful, except for Beau who was left with no choice but to go to the local shelter. He’s been living at Putnam Humane Society since, and we feel so bad for him! No dog should have to live in a shelter for 3 months, especially one as sweet and friendly as this guy. He’s great with all people and dogs, and loves to run and play. If you or anyone you know is interested in adopting this wonderful dog, please go visit him at the Putnam Humane Society in Carmel, NY.